Carboys and Indians: Pontiac entered a "bold" new era in 1958: it was the last year legendary designer Harley Earl would style cars like the chieftain. Nineteen fifty-eight was a big year for General Motors. It marked a kind of turning point, being at once the Corporation's 50th anniversary and the year in which Harley Earl finally threw in his chrome-laden trowel. Earl ran styling at GM from its inception in 1927 through to December 1958, when his second-in-charge Bill Mitchell could not contain his joy at taking over. The Pontiac Chieftain you see here was one of the last cars on which Earl called the styling shots. 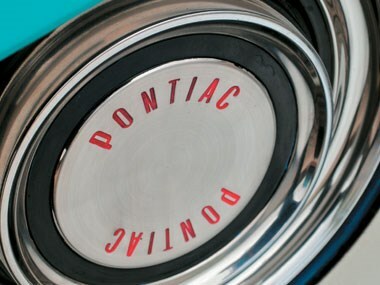 And 1958 was the last year that Native American Indian names were brazenly associated with the Pontiac marque, which was named after Chief Pontiac, the legendary Canadian warrior who worked with the French to try and evict British settlers in the mid-1770s (though the subtler Star Chief name continued). So it was a significant year for the General Motors big picture and for Pontiac. 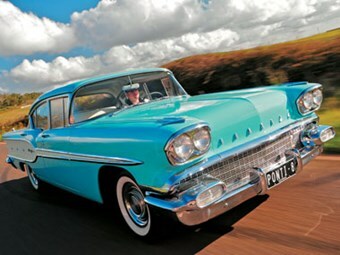 Pontiac claimed its 1958 cars represented "The Boldest Advance in Fifty Years". 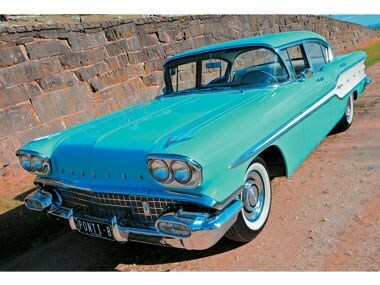 The Bonneville went from limited production status in 1957 to a regular series and flagship of the range, while the Chieftain was the entry-level Pontiac. There were seven Chieftain variants including two- and four-door sedans, two- and four-door hardtops and a convertible. The mind boggles at such variety, especially when you consider the Chieftain was one of four Pontiac lines. Fortunately, perhaps, Earl had less direct influence at Pontiac that year than he exercised at Buick. Earl's successor, Mitchell, recalls a crash program on the '58 Buicks, arguably one of the most over-decorated vehicles in Detroit's history: "Harley Earl called us together and told Ned Nickles to get Stan Parker to put 100 pounds of chrome on the sides." After lunch, he complained that there were only 80 additional pounds! Little wonder that Bill Mitchell was impatient to take over and impose his own, cleaner style - epitomised in the 1963 Buick Riviera. In his landmark work, The Art of American Car Design, C. Edson Armi concludes: "Fifties designers said that this Buick, more than any other car (with the possible exception of the '58 Oldsmobile, nicknamed the King of Chrome) 'sang with stinkle' (shone with glitter)." The 1958 Pontiac Chieftain bore a model name that might retrospectively be seen as being in poor taste, but at least it escaped the worst of Earl's misguided excesses. 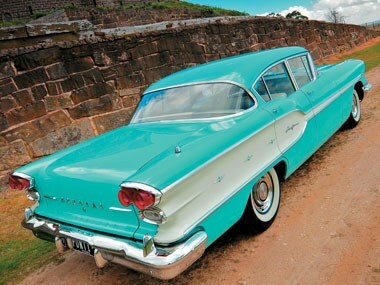 Pontiacs are arguably the best-looking of all General Motors' 1958 Detroit offerings. This is despite claims by some that the Chieftain lacked clear Pontiac identity and was too easily confused with its larger Oldsmobile (from the side) and Buick (from the front) siblings. Not from where I sit, it wasn't! The Pontiac design is cleaner and less ornately chromed (I'll have the Bonneville Sport Coupe in solid red!). It was all happening in 1958. Joe Schemansky (who would later design the HD Holden) was appointed chief stylist of the Pontiac Division in December '57. When I interviewed Schemansky (who died in 2004) for Wheels in 1985, he told me that his brief on appointment had been to "take Pontiac out of the high-button shoe class". The cars were relatively conservative in design, and Schemansky's job really started with the Wide-Track 1959 range that won the coveted Motor Trend Car of the Year award. If the Wide-Track '59s foreshadowed the sensational Pontiac Grand Prix and GTO of the 1960s, the process really began on June 1, 1956 when Semon Emil 'Bunkie' Knudsen took up his position as general manager of Pontiac. Moving Pontiac out of the high-button shoe class involved more than sexier styling. Knudsen, whose nickname came from sharing the same bunk with his father on a childhood camping trip, disregarded the so-called 'gentleman's agreement' inspired by Ford to keep the Detroit car manufacturers out of motor racing. He gave chief engineer Pete Estes the green light to increase compression ratios and get throttles to open more quickly. 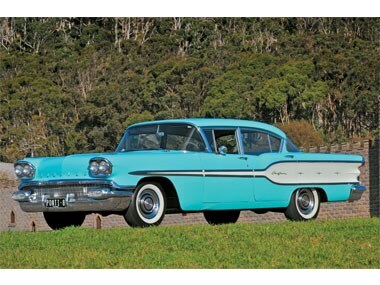 The 1958 V8-engined Pontiacs scored the '57 Bonneville's 370 cubic-inch block as standard (although buyers could still specify a lowly six) and fuel-injection was optional on all models also specified with an automatic transmission. For the first time, a Safe-T-Track limited-slip differential was added to the extras list. In a year when Buddy Holly, Elvis, Chuck Berry and Ritchie Valens were dominating the airwaves, it seemed only right that buyers could choose an optional transistor radio that could be removed from the car and used as a portable hi-fi. The strong push towards performance began in 1957 with the introduction of the limited-edition Bonneville. 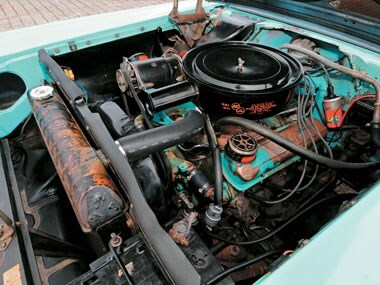 Beneath the bonnet was Pontiac's 'Tri-Power' induction set-up comprising triple, in-line, two-barrel carburettors. With a compression ratio of 10.25:1, claimed peak power was 321hp (239kW). 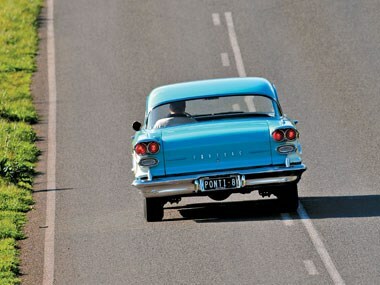 One Tri-Power Pontiac set a new lap record at the 1959 Daytona Speed Week, averaging 131.747mph (212km/h). At Speed Week in February 1958, Pontiacs filled the first six positions in their category (Class Seven) with speeds over the flying mile of up to 137.693mph (222km/h), which meant that Knudsen had achieved his aim of re-establishing Pontiac as a performance-oriented brand. 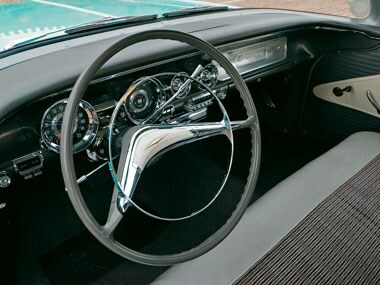 Mechanically, the '58 Pontiacs were significantly revised. The tailshaft ran through the centre of the new cruciform frame which had five crossmembers. Rear leaf springs made way for coils. Modifications made to minimise dive, squat and sway were given a new name, Quadra-Poise. 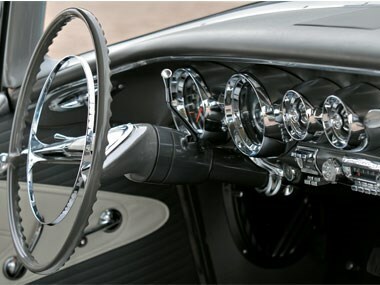 And air suspension was on the options list one year after the glorious Cadillac Eldorado Brougham, whose air suspension was a knee-jerk response to the Citroën Diesse that was the star of the 1955 Paris Salon. In an era that was moving from kids' cowboys-and-Indians games towards recognition of the Wounded Knee Massacre of 1890 (the last major battle between white US soldiers and the Native American people), Knudsen wanted to remove Native Indian imagery from the Pontiac range. In 1959 the model names were changed. The Catalina became a series in its own right, replacing the Chieftain. The only remaining name that carried any Indian connotations was Star Chief. Undoubtedly, the 1958 cars have been overshadowed in memory by the fabulous Wide-Track '59s, but even so, it is difficult to understand why 1958 sales were down to less than five percent of the market - Pontiac's poorest result since 1934. Perhaps it was because that, despite the extensive engineering advances, the 1958 cars just weren't quite extroverted enough!